21st Amendment Hop Crisis | Drink. Blog. Repeat. While 21st Amendment doesn’t distribute to South Carolina – can we fix that soon? Please? – I’ve managed to try all but one of their regularly released beers, and they’ve all been stellar. My wife buys a six-pack of Hell or High Watermelon any time she comes across one, and I’ve been wowed by Monk’s Blood, thought Allies Win the War was unique and impressive and find Fireside Chat (review coming soon) to be one of the best winter warmers I’ve had. 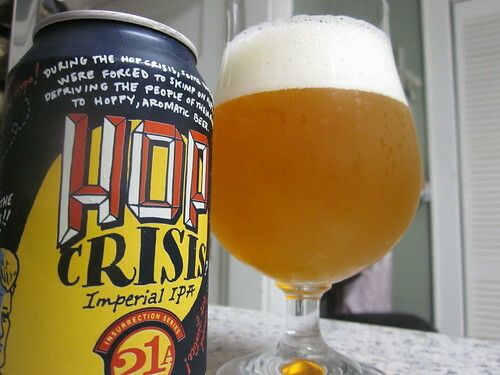 Until now, only one of the brewery’s beers has eluded me: Hop Crisis, their oak-aged imperial IPA. It’s not that it was hard to get; it was more like I was never in the right place at the right time. But fortunately, my birthday weekend in Atlanta yielded a four pack, and the beer lived up to the hype I’d heard surrounding it. Side note: When a brewery sends press samples of a beer in a box of hops, it’s a good way of making a hophead like myself extremely jealous. The beer pours a slightly hazy sunset orange topped with a fluffy three-finger head that sticks around for a while. The lacing is really nice and holds fast to the side of the glass, but I was surprised to not see a lot of alcohol legs. On the nose is a really vibrant citrus note and a bright pine scent. There’s a bit of an orange scent to it as well with a big overtone of tanginess. It’s all sort of subdued and soft with nothing popping really strongly. The bitterness on the front of the tongue is pretty mild but it does grow a but more across the palate. In the middle of the mouth, you get that lemon and citrus note very strongly. The oak notes are really big on the back and impart a sort of caramel sweetness and maybe even a little cherry tartness. But as it settles, the incredible hop flavor takes over. It’s bright but resinous and really, really piney. Major hop mouth on this one. I was worried this one wouldn’t live up to the hype for me. The nose was a bit underwhelming, but the flavor was awesome. It’s dank as hell and incredibly oak-forward. As you drink, it all blends together into this piney, oaky penetrating flavor that clings to your mouth. It’s great stuff, but I’d expect nothing less from 21st Amendment. I’m always weary of oak-aged IPAs – they play too many tricks on my palate – but I’m always for trying them. I think 21st Amendment really does “big” or “warmer” beers well like Fireside Chat (awesome) and Monk’s Blood (AWESOME), so I could see this perhaps being an exception to my tastes. I think it would help since it seems Hop Crisis has such intense hop characteristics. Oak-aged IPAs have been a hit with me so far. White Oak Jai Alai was just phenomenal. This was a bit more woody and rougher on the palate, but by no means is it an abrasive beer. The oak does a nice job of helping to balance the intense hop profile. It’s 94 IBU and has Columbus, Centennial and Cascade, then dry-hopped with Simcoe, Athanum, Amarillo and Cascade. So, yeah, it’s damn hoppy. But I agree with you on their darker beers. That’s where they really shine. I’m looking forward to getting into the sixer of Fireside Chat I’ve got as well.